This astounding 2018 Great Britain 1 oz Platinum Queen's Beast (Griffin) Coin is the new released in the beloved Queen’s Beasts series from the Royal Mint. 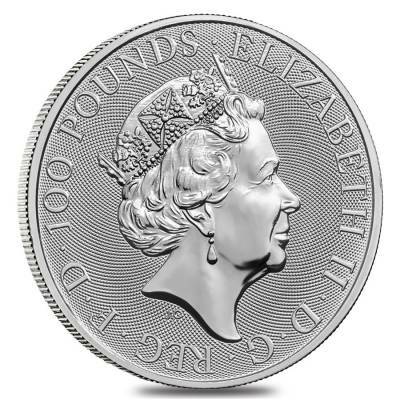 Struck from 999.5 pure platinum with a weight of 1 troy ounce, this coin is a treasured addition to your portfolio and a precious gift for any passionate numismatist. In 2016 the British Royal Mint introduced its beautiful Queen’s Beasts series, simultaneously releasing its first Beast coin - the Lion. The series celebrates centuries of royalty and heraldic history by depicting new designs of the ten British heraldic beasts that stood guard at Her Majesty’s coronation in 1953: the Lion of England, the Griffin of Edward III, the Red Dragon of Wales, the Falcon of the Plantagenets, the Black Bull of Clarence, the Yale of Beaufort, the White Lion Mortimer, the Unicorn of Scotland, and the White Horse of Hanover. The Griffin is an ancient mythical beast, who symbolizes courage and strength combined with protection and diligence. It was associated with Edward III who engraved it on his private seal. The shield presents the Round Tower of Windsor Castle, where Edward III was born, also the Royal Standard flying from the turret, enclosed by two branches of oak surmounted by the royal crown. Made from .9995 fine platinum with a weight of 1 oz. Struck by the Royal Mint. A face value of £100 (GBP). Individual coins are packaged in a plastic flip. Lots of 10 come in mint-issued tubes. Legal tender of the United Kingdom. 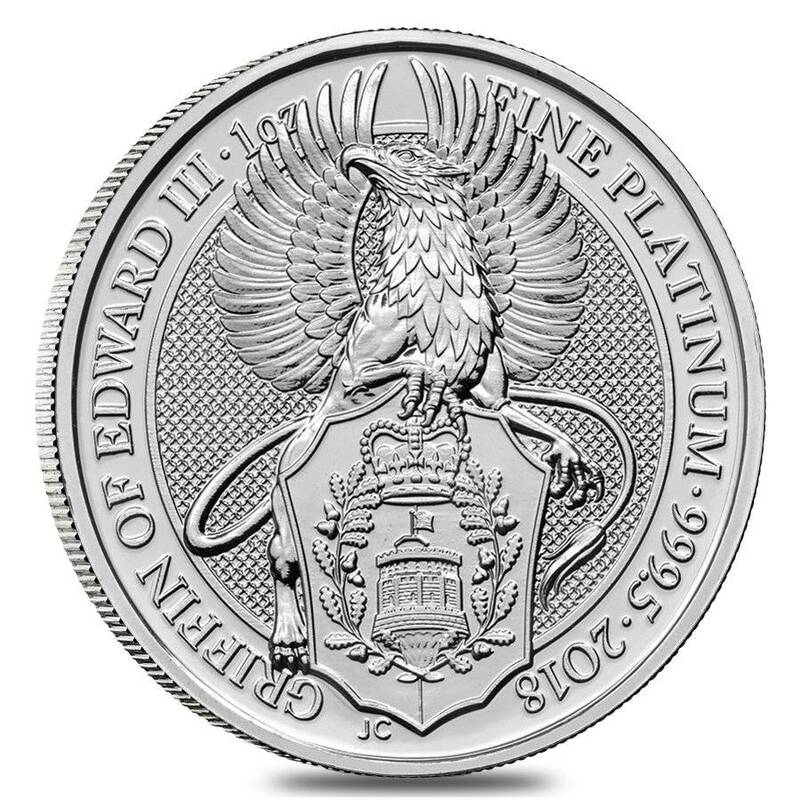 Obverse: Features a stylized image of the Griffin of Edward III. 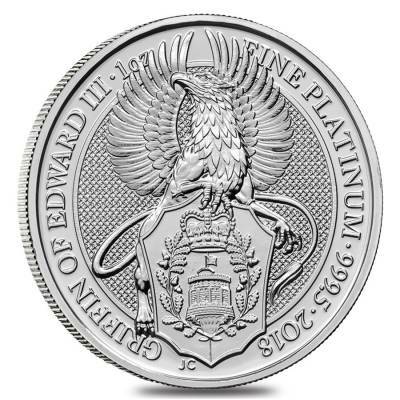 Inscriptions of “GRIFFIN OF EDWARD III”, JC in reference to the designer, and the weight, purity, and year of mintage circle the edges. Reverse: Showcases the effigy of Queen Elizabeth II. Inscriptions: “Elizabeth II”, “D.G. REG F.D” (Queen by the Grace of God), and the denomination. Bullion Exchanges offers you a wide selection of exclusive items from renowned international refineries. Add this splendid 2018 Great Britain 1 oz Platinum Queen's Beast (Griffin) Coin to your collection today, and it will be carefully wrapped, packaged, and delivered to your address. If you have any questions, just call us at 800.852.6884, or send us a message through our convenient web portal and our customer service representatives will be happy to assist you. For every $1 spend, you will earn 1 Bullionaire Buck which is equivalent to $0.001 off a future purchase. 977 BB = $0.98.